Copeland’s surgery, which involved implanting four tiny microelectrode arrays each about half the size of a shirt button in his brain, is a medical first. The implants connect to the Brain Computer Interface (BCI), developed by researchers at the University of Pittsburgh. The team describes the results in Science Translational Medicine . “The most important result in this study is that microstimulation of sensory cortex can elicit natural sensation instead of tingling,” says study coauthor Andrew B. Schwartz, professor of neurobiology and chair in systems neuroscience. “This stimulation is safe, and the evoked sensations are stable over months. This is not the team’s first attempt at a BCI. Four years ago, study coauthor Jennifer Collinger, assistant professor in physical medicine and rehabilitation, and research scientist for the VA Pittsburgh Healthcare System, and the team demonstrated a BCI that helped Jan Scheuermann, who has quadriplegia caused by a degenerative disease. The video of Scheuermann feeding herself chocolate using the mind-controlled robotic arm was seen around the world. Before that, Tim Hemmes, paralyzed in a motorcycle accident, reached out to touch hands with his girlfriend . For study leader Robert Gaunt, assistant professor of physical medicine and rehabilitation, that was the next step for the BCI. 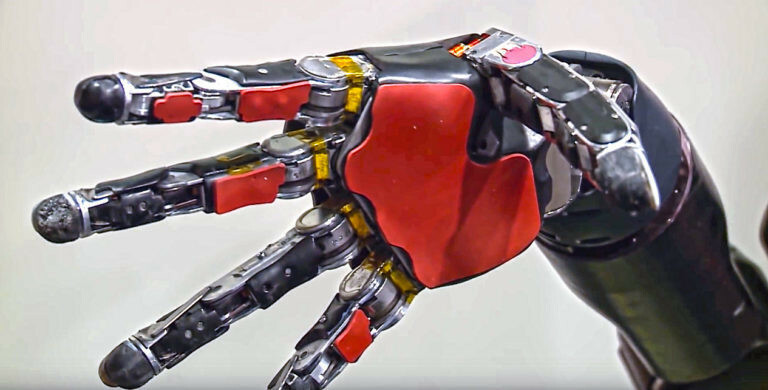 As Gaunt and colleagues were looking for the right candidate, they developed and refined their system such that inputs from the robotic arm are transmitted through a microelectrode array implanted in the brain where the neurons that control hand movement and touch are located. The microelectrode array and its control system, which were developed by Blackrock Microsystems, along with the robotic arm, which was built by Johns Hopkins University’s Applied Physics Lab, formed all the pieces of the puzzle. In the winter of 2004, Copeland, who was 18 at the time, was driving at night in rainy weather when he was in a car accident that snapped his neck and injured his spinal cord, leaving him with quadriplegia from the upper chest down. After the accident, he had enrolled on a registry of patients willing to participate in clinical trials. Nearly a decade later, the research team asked if he was interested in participating in the experimental study. After he passed the screening tests, Copeland was wheeled into the operating room last spring. Imaging techniques were used to identify the exact regions in Copeland’s brain corresponding to feelings in each of his fingers and his palm. At this time, Copeland can feel pressure and distinguish its intensity to some extent, though he cannot identify whether a substance is hot or cold, explains study co-investigator and neurosurgeon Elizabeth Tyler-Kabara. Gaunt says everything about the work is meant to make use of the brain’s natural, existing abilities to give people back what was lost but not forgotten. The Defense Advanced Research Projects Agency’s Revolutionizing Prosthetics program provided most of the funding.